Volkswagen is entering the yearly race up Pikes Peak with a lightweight custom racer. Called the I.D. 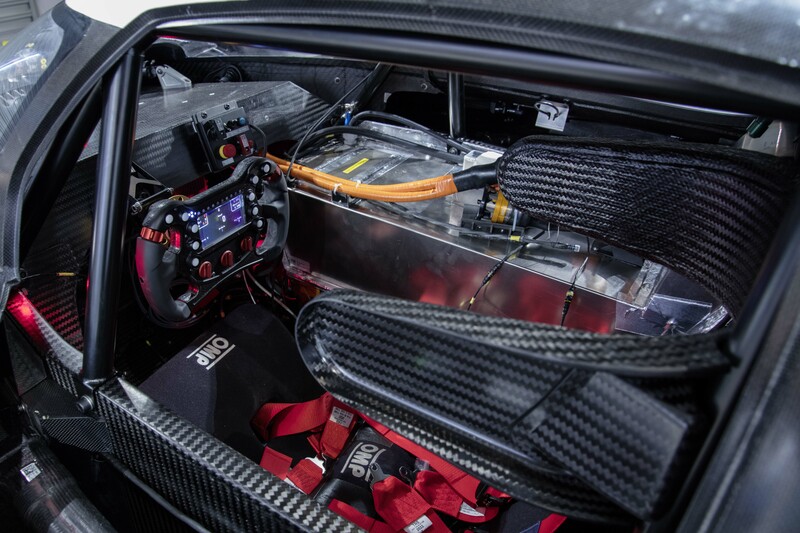 R Pikes Peak, two electric engines are good for 680 hp and 479 lb-ft of torque. The whole package weighs less than 2,500 lbs and VW says the vehicle is good for a 0-60 time of 2.25 seconds. That makes this car faster off the line than a Formula 1 or Formula E car — and just slightly faster than a Model S launching in Ludicrous mode. VW says the racer was developed as an exercise in balancing weight and electrical energy capacity. This racer uses lithium-ion batteries and the dual electric motors act as generators during breaking, allowing the vehicle to recapture lost energy and feed it back into the batteries. The Pikes Peak race has long been used as a test bed for vehicle manufacturers. The race is a tough 4,720 vertical-foot climb up a winding path with 156 corners. A modified Peugeot 208 set the current record in 2013 of 8 minutes and 13 seconds, yet in 2016 a custom electric vehicle from Latvia came close to the record with a time of 8:57.118. The driver, Rhys Millen, says the run could have been up to 30 seconds quicker, but half of the vehicle’s powertrain failed halfway through the climb. This car, an eO PP100, had 1,190 kilowatts (1,600 hp) torque 2520 Nm, with a weight of 1200 kg. Volkswagen’s attempt is to best the electric record with a vehicle significantly less powerful and almost twice as heavy. As for the comparison against the Tesla Model S, while the 0-60 speeds are similar on paper (2.25 seconds verse 2.3 seconds), it’s not fair to compare the two in real-world testing. In order to get the Tesla to hit 60 mph in 2.3 seconds, which is possible, specific conditions have to be met and it can only hit that speed off the line. The vehicle’s software also limits the amount of time the Model S is able to launch at this speed. Meanwhile, the VW racer is likely able to accelerate at such velocity coming off corners again and again — racing tires help, too. Often, if racing up a mountain or around a road track, the ability to recover from dips in speed is where races are won, and with 156 corners, there are plenty of opportunities for Volkswagen to recover from dips.